Klasmann-Deilmann is com­mit­ted to sup­por­ting and encou­ra­ging young peop­le. That’s why we’re invol­ved in the ‘Deutsch­land­sti­pen­di­um’ scho­l­ar­ship sche­me, which has pro­ved to be a ‘win-win-win’ situa­ti­on! An ani­ma­ted trio are wal­king around our Gees­te site tog­e­ther. 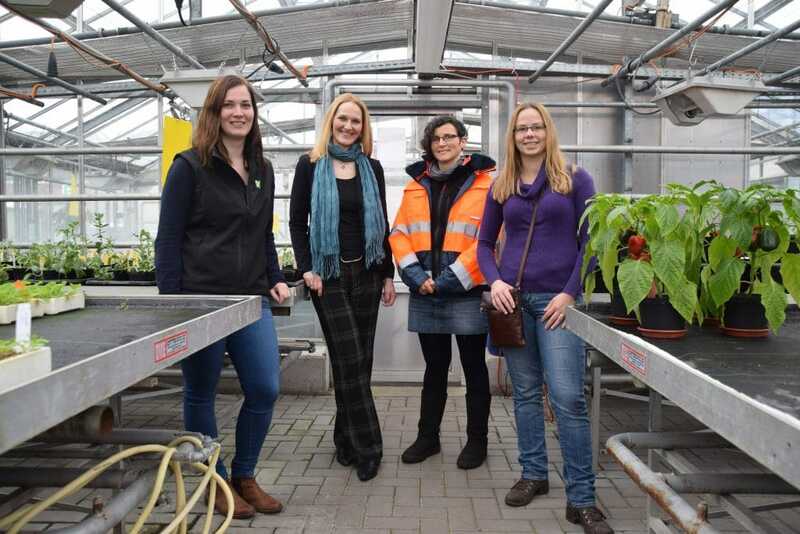 Anja Frit­zen (Advi­so­ry Ser­vices) and The­re­sa Rob­be (Qua­li­ty Manage­ment) are sho­wing Lisa Pad­eff­ke the pro­duc­tion area, lab and green­house. They are exp­lai­ning to her how our busi­ness works and how dif­fe­rent parts of our ope­ra­ti­ons inter­act to crea­te the end pro­duct: a sub­stra­te per­fec­t­ly tailo­red to each customer’s crop requi­re­ments. Lisa, our visi­tor in Gees­te, is the hol­der of a ‘Deutsch­land­sti­pen­di­um’ scho­l­ar­ship. She is taking a look at the various pro­duc­tion pro­ces­ses, lis­ten­ing and asking ques­ti­ons; and, of cour­se, the small group is having a few laughs as well. The stu­dent was fami­li­ar with Klasmann-Deilmann even befo­re she star­ted her degree. “If you’re stu­dy­ing at Osna­brück Uni­ver­si­ty of App­lied Sci­en­ces, you can hard­ly avo­id Klasmann-Deilmann,” she ack­now­led­ges. Lisa is in the fifth semes­ter of her cour­se in Hor­ti­cul­tu­ral Pro­duc­tion. “In my pro­ject the­sis, for examp­le, my focus was on a Klasmann-Deilmann sub­stra­te; I con­duc­ted and eva­lua­ted tri­als using it,” she con­ti­nues. Deutsch­land­sti­pen­di­um scho­l­ar­ships have been awar­ded sin­ce the sum­mer semes­ter of 2011. This pro­gram­me assists talen­ted and high-achie­ving stu­dents of all sub­jec­ts at hig­her-edu­ca­ti­on cen­tres in Ger­ma­ny. Hol­ders recei­ve fun­ding of 300 euros/month (half from pri­va­te-sec­tor fun­d­ers and half from the Federal Government). First, the hig­her-edu­ca­ti­on insti­tu­tes sup­ply the fun­d­ers with (anony­mi­sed) pro­files of sui­ta­ble can­di­da­tes. The fun­d­ers pick the best match from the­se pro­files and then pro­vi­de the reci­pi­ent with ongo­ing per­so­nal sup­port.